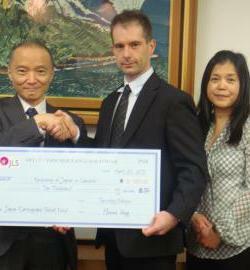 On April 20th 2011 at the Japanese Embassy in Ottawa, Ambassador Ichikawa received from OJLS a cheque for $10,000 for the Earthquake Relief Fund, presented by Tim Folkins (Chairperson), Kazuko Kobayashi (Principal), Yoko Mongeon (Vice-Principal) and Mike Haag (Treasurer). Many thanks to all those members and friends of the school that donated! Aside from collecting donations,“Senbazuru” (one thousand origami cranes) with messages written on the wings were prepared for one of the elementary schools in the severely affected areas. Originally the OJLS board had decided to donate $1000 directly and to match a further $2000 dollar-for-dollar for donations from students. 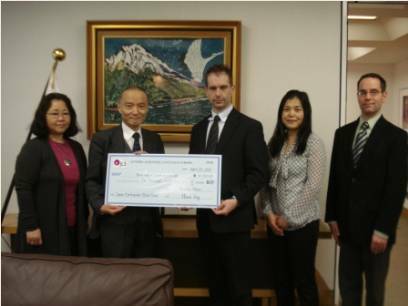 In light of the generous total of $5,885.79 collected, the board voted to round-up the school's matching contribution to $3,114,21 in order to make the total donation to the Tohoku-Pacific earthquake relief efforts $10,000.